You are not mistaken: it is what I mean because the studio is the home for an artist as well as for his creative works. Let it be just an online studio. It’s even better for the first acquaintance. In any case, it is easier and less time consuming to see the artworks which are exhibited in a virtual space than in a real studio. Not only for themselves do artists create their works, but for their viewers whose opinions are supposed to be taken into consideration. Admittedly, exhibiting their works, the artist tries to have more personal connections with people. To my mind, hardly ever any of us doesn’t try to find their way of self-expression. I’ve always dreamt of becoming an artist ever since I remember myself. I don’t know why in my childhood, I was fond of copying of different pictures: beautiful landscapes, flowers and also the pictures of famous artists. It might be due to my admiration of beauty. Eventually, I got the moral support from my secondary school drawing teacher, Yuri Romanovich Khlebnikov, who was a very passionate about art. He instilled in me the love of nature and the interest to the heritage of French Impressionists. Although I studied later on at the Ekaterinburg Art College and St. Petersburg Repin Art Institute (former St. Petersburg Imperial Academy of Fine Arts), I’ve never forgotten the lessons of my first teacher. It goes without saying that I came to my next milestone when I started studying in the Repin Art Institute under the guidance of such prominent artists as Andrey Mylnikov, Alexander Korolev, and Alexey Sokolov. Many other known nationwide artists such as Evsei Moiseenko, Boris Ugarov, and Yury Neprintsev also exerted significant influence on my creative works. Not only the favorite pastime is painting for me, but the way to study the world around me. It was that attitude which was used by the impressionists, who in parallel with scientists were studying the important features of light: for me it was the way to the understanding of nature. When I was young, I worked in different styles, trying to find out more about the world around us, expressing it in lines and colours. I was fond of Matisse and Modigliani, Picasso and Cezanne.In addition to this, I was interested in the new discoveries of modern artists related to use of colour and composition. However, I have always been firmly convinced that new and original art forms do exist not only to the satisfaction of the artist’s ambitions, or to impress the public, but it is that which should stem from the artist’s abilities to give the powerful image of the real world. In my view, it is extremely challenging to achieve the exceptional completeness while painting in the open air, however, easy it may look. It was the most important reason why the impressionist paintings didn’t gain either wide public acclaim or the recognition of official critics, as they deserved, at that time. Revolutionary and groundbreaking, though, for vast majority these paintings looked as unfinished. What could be more exciting than studying the word around us by means of art! Nevertheless, you always have to face routine problems. 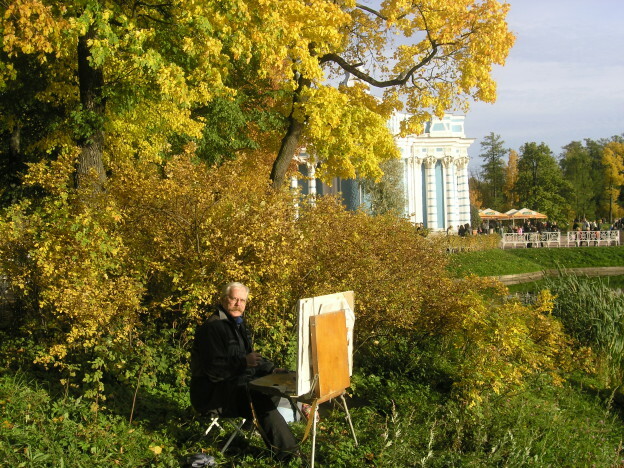 For example, how to get the proper state of light at the beginning of the work and not to lose in the final stage while working on a landscape painting or painting a portrait in the open air. The problem is in which moment the finishing touches should be put on the canvas? It is not a secret that, for example, Valentin Serov insisted his models on having as many sittings as possible to achieve the perfection while expressing elusiveness of light. Another important factor is the spirit of a place. It is that what we consider so beneficial to people to be immersed in a particular environment. For me, as the artist who much of life devoted to landscape painting, this factor is crucial. It goes without saying, the artist can get his message across better through the most successful of his artworks. Suffice it to say, the suburban area of St. Petersburg, and, in particular, Pushkin and Pavlovsk, are well-known for its authentic atmosphere. For me, it is the symphony, which comprises such elements as art, natural beauties and the fascination of the historical personalities. Having the great experience of exploring of, literally, every corner of these parks, I can’t help but try to discover the views which are new to my eye. When you find out finally these moments, which are ready to be painted, you forget about everything you had to deal with before: unpredictable weather, long distance to get there, and, perhaps, the possible dissatisfaction from your painted canvas in the future. What’s more, looking at the pictures painted in summer, you recollect those delightful moments, which have already gone. All colours, sounds and smells become alive, evoking some sensorial memories. It is like a glass of Ray Bradbury’s Dandelion Wine, which symbolizes all natural cycle: awakening, flourishing, and fading of nature. Therefore, you are looking forward to the meeting with the natural beauty. All in all, it would be fair to say, if somebody can share my ideas, I would be the biggest stroke of luck for the artist.